Carol Meldrum is the author of Knitted Icons and I have a feeling I’m going to have to get hold of this book so I can help Moon complete her goal of an Elvis-infused bedroom. Seriously, how fun is that? Of course, I’ve got many other projects queued up first. My nephew admired the socks I made for Sister #1, so I’m going to try and make him some for his birthday. I’m already working on a scarf, I’m planning socks for SpiritMan and Moon, and I was thinking about trying to knit a sweater this month. If only I had a day every week to devote completely to knitting and only knitting. Tomorrow is Moon’s master class at Good ‘n Loud, though, so I should be able to accomplish something while I’m listening to the kids and SpiritMan rock out. I wanna go to Master Class sometime! I hear there are awesome singing opportunities! Great tribute to Gramma N! 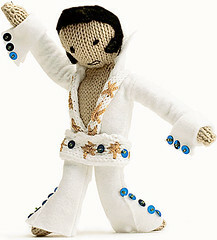 Please send me this pattern I am an Elvis freak and it would add to my collection.